Fall apples inspire this Thanksgiving feast of Cider Roasted Turkey with Sausage Apple Stuffing and Cider Gravy. 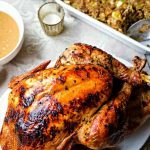 The dry-brined turkey is infused with apple flavor from a buttery apple cider injection as well as from being roasted and stuffed with apples, garlic, and fresh sage. The Italian Sausage Apple Stuffing is made with tart Granny Smith apples and is both savory and sweet – a perfect complement to the juicy cider-roasted turkey. Rich broth from the roasted turkey, more apple cider, and a bit of sweet onion make up the Cider Gravy to crown it all! This apple cider turkey recipe will be sure to be requested year after year! I am proud to be partnering with OXO to bring you this tasty recipe! I personally own a lot of OXO products and love them! Do you have special Thanksgiving traditions that make your holiday extra special? Ever since our girls were babies, we’ve helped my in-laws put up and decorate their Christmas tree on Thanksgiving night. For 30 years, our Thanksgiving day has been spent watching the Macy’s parade, cooking and eating a huge feast, and finally, decorating the Thigpen tree. It’s our official kick-off to the holiday season! My mother-in-law has collected hundreds of ornaments during her 60 years of marriage and every one of them holds a very special meaning. She’ll tell you that she’s sentimental, and I don’t doubt it one bit! As we unbox her treasures, she reminisces over where each ornament came from and who gifted it to her. Some ornaments were handmade by her children, some were souvenirs from vacations, and some were gifts given by friends and neighbors. Regardless, each one is a memory and a perfect reminder of all that is important when we gather together as family. The most treasured ornaments are the “first Christmas” ornaments of the four Thigpen granddaughters and two great granddaughters. We’re excited that our first grandchild is due in less than a month, so we’ll be adding a brand new ornament to Great Grandma Sue’s collection! Making a full Thanksgiving dinner is quite an undertaking. The first time I made the family’s Thanksgiving turkey, I was a nervous wreck! At the time, I was a pretty novice cook and was worried about ruining everyone’s holiday! What I know now is that a little planning, great cooking tools (like OXO) and the right recipe makes all the difference. Follow along and I’ll give you step-by-step directions for preparing my turkey recipe. Start the night before by prepping the turkey with a dry brine, or a salt rub. For this recipe, I used plain table salt. Remove the turkey from the packaging, rinse and pat dry, and then sprinkle two tablespoons of salt inside and outside. Cover with plastic wrap and store in the refrigerator overnight. The next day, unwrap the turkey and place on a roasting rack. Stuff the cavity with apples, garlic, and sage and tie the legs together with kitchen string. Next, prepare the cider injection. This recipe only requires three ingredients—butter, apple cider, and fresh minced sage leaves. Melt the butter and stir in the sage and warmed apple cider. 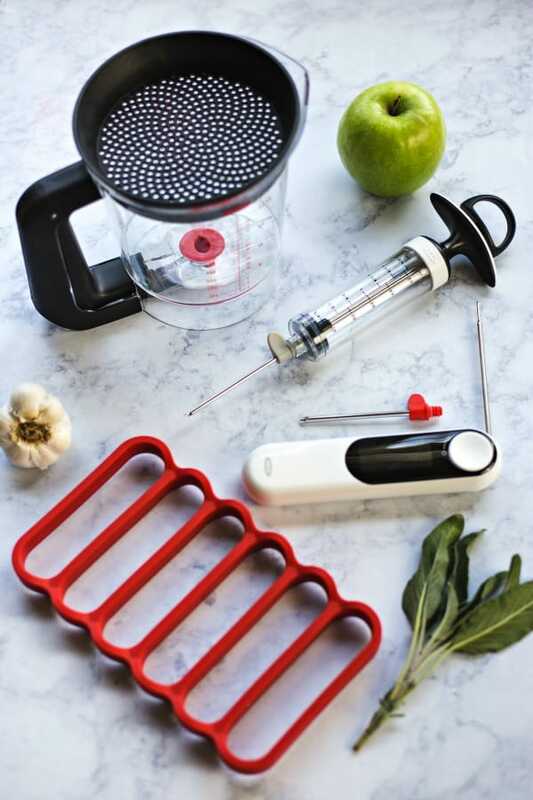 Because there are herbs in the cider injection, you’ll want to attach the wide needle to the OXO Flavor Injector (the Flavor Injector comes with two needles for thick and thin marinades). There will be enough marinade to fill the Flavor Injector several times—so you can prep the turkey with plenty of buttery goodness! Inject the needle into the turkey breasts and legs and pump in the cider mixture. 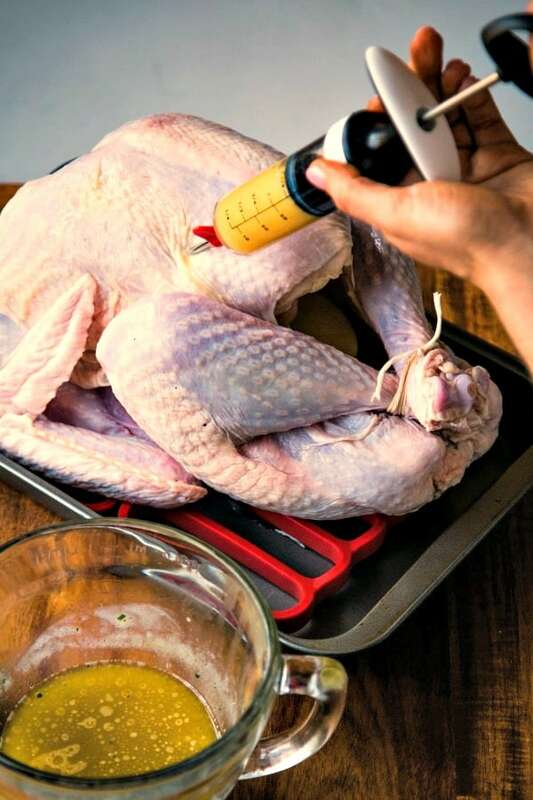 Be sure to inject into multiple spots so that you flavor the entire turkey. Some of the mixture may ooze through the skin, but that’s all right. Save a little of the marinade to rub over the outside skin on the breast and legs. Roast the turkey for one hour uncovered, then tent with aluminum foil and bake for two more hours. The turkey is done when the temperature on the inner thigh registers 165 degrees. 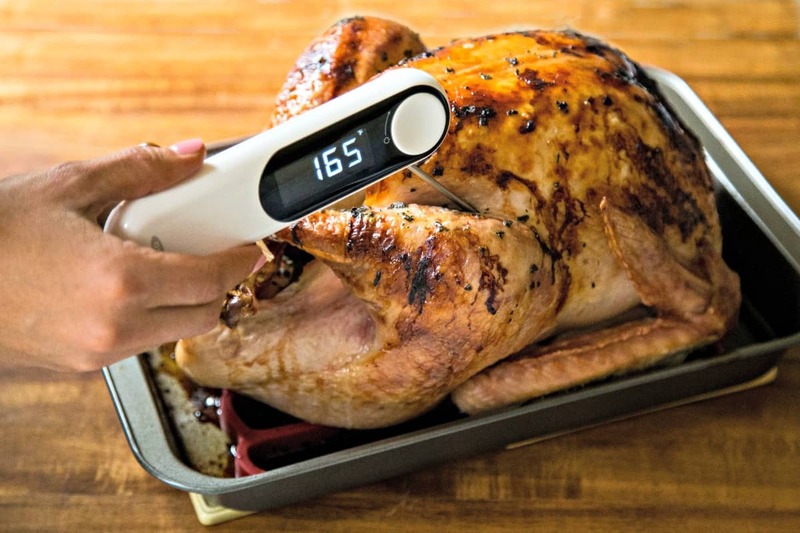 To check the temperature of the turkey, I used the OXO Thermocouple Thermometer which provides accurate temperature readings in seconds. Allow the turkey to rest 30 minutes before carving. 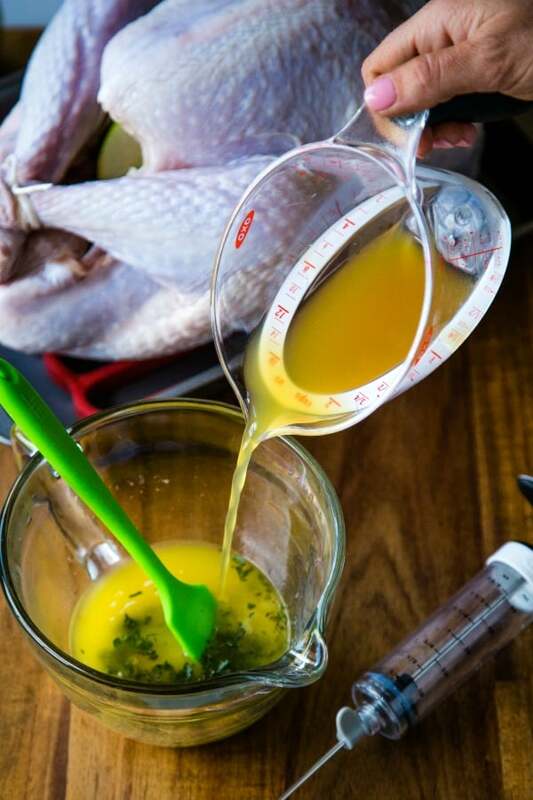 Pour the turkey broth, or drippings, into an OXO Good Gravy Fat Separator. The fat will rise to the top. leaving the rich turkey broth on the bottom. To make the cider gravy, cook diced onion in butter until translucent. Add minced garlic and cook for 30 more seconds until fragrant. Stir in flour to make a roux. Slowly add apple cider and turkey broth. 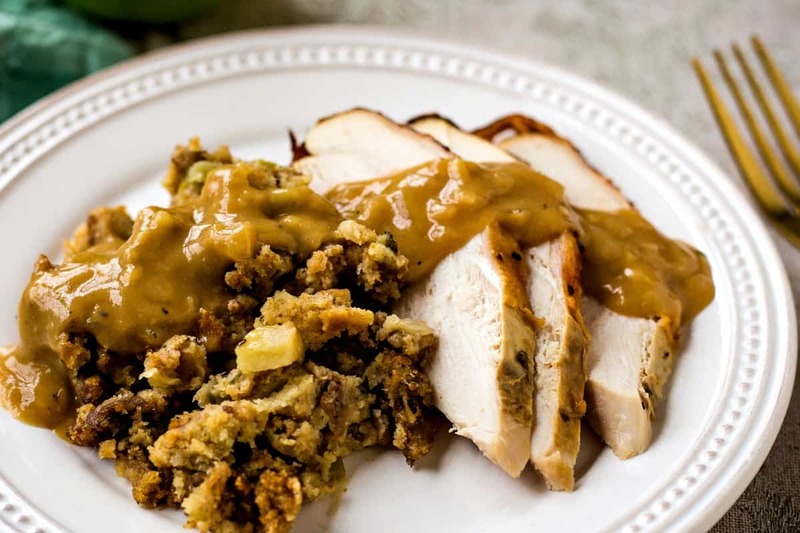 Whisk the gravy mixture until smooth and thickened, then serve immediately with the Cider Roasted Turkey and Sausage Apple Stuffing (see full recipe below). Good Gravy Fat Separator – This nifty gadget not only separates fat for a healthier gravy in my turkey recipe, but is useful in soups and stews. I love that you squeeze the built-in trigger on the handle to release the rich broth from the bottom and leave fat behind…and with no drips! Silicone Roasting Rack – 2 Pack – No need to buy an expensive roasting pan that you may only use once a year! A regular 9×13 cake pan can be transformed into a proper roasting pan with the OXO Silicone Roasting Racks. The racks elevate food above fat and liquid and allow air to circulate around food for faster, more even roasting. Flavor Injector – This was my first time using a flavor injector and I love the results! My turkey turned out delicious and juicy. The kit includes two needles for thick or thin marinades which are easily stored inside injector tubes when not in use. Thermocouple Thermometer – I’ve used other thermometers, but none have been as easy to use—I love the digital display! The Thermocouple Thermometer provides temperature readings in just 2-3 seconds with an accuracy of ±0.9°F, so you can ensure perfection in every piece of meat. No more guessing if the bird is done! 1 Day before roasting the turkey — Use table salt to dry brine the turkey. Cover in plastic wrap and place in the refrigerator overnight. 3-1/2 Hours before serving the turkey — Stuff the cavity of the turkey with apples, garlic, and fresh sage, then inject the bird with the buttery cider mixture and put in the oven to roast. 1 Hour before serving the turkey — Prepare the Apple Sage Stuffing and bake alongside the turkey. When done, leave in a warm oven until ready to serve, or remove and cover with aluminum foil to keep warm. 30 minutes before serving the turkey — Prepare the Cider Gravy and carve the turkey. 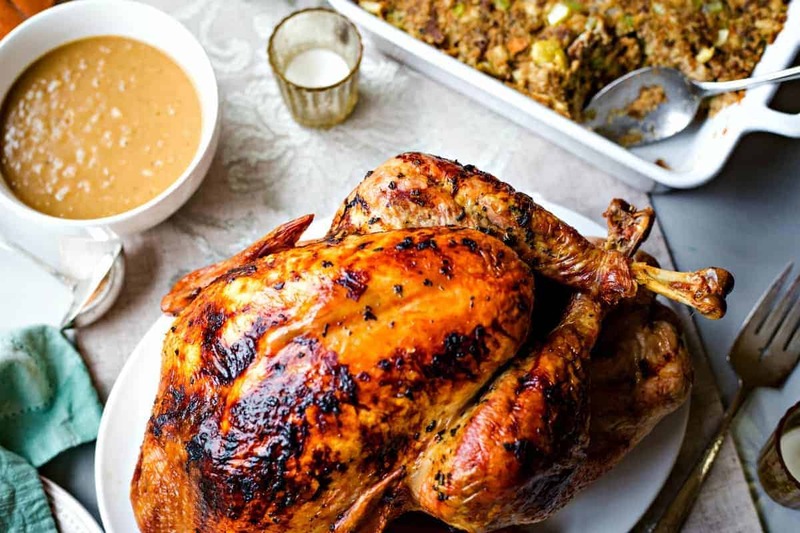 DID YOU MAKE THIS CIDER ROASTED TURKEY WITH SAUSAGE APPLE STUFFING AND CIDER GRAVY RECIPE? Who will be joining you for your holiday celebration? If you like this recipe, please do me a favor and give it a 5-star rating! And, if you’re into sharing photos of your cooking adventures, please tag @lifeloveandgoodfood on Instagram and hashtag it #lifeloveandgoodfood. Happy Thanksgiving, friends! 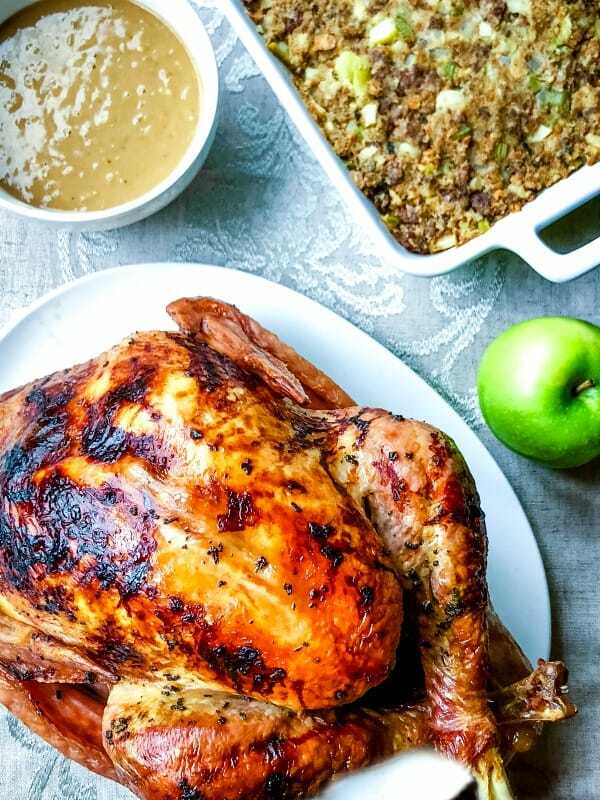 This dry-brined turkey is infused with apple flavor from a buttery apple cider injection as well as from being roasted and stuffed with apples, garlic, and fresh sage. Remove turkey from packaging and discard neck bone, giblets, and liver (or freeze to make turkey stock at a later time). Rinse in cool water and pat dry inside and out with a paper towel. Season the turkey inside and out with the salt. Cover with plastic wrap and refrigerate over night. Preheat oven to 350 degrees. Place the turkey on a roasting rack. Quarter the apple and slice the head of garlic in half and place inside the turkey cavity with 6 fresh sage leaves. Use kitchen string to tie the legs together. Stir together the butter and apple cider (TIP: warm the apple cider to prevent the melted butter from setting up). Finely chop 6 fresh sage leaves and add to the butter mixture. 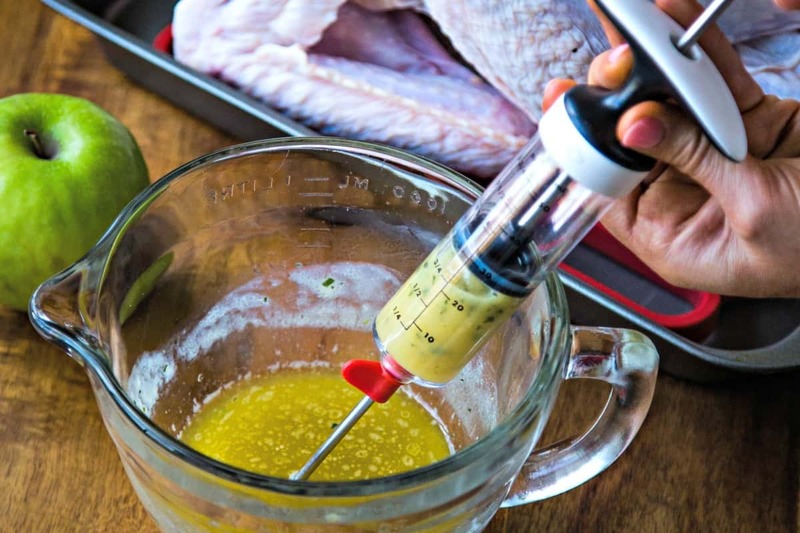 Using the OXO Flavor Injector with a wide needle, inject the butter mixture under the skin of the turkey (inject in multiple places all over the breast and legs), reserving about two tablespoons. Rub the remaining butter mixture on top of the breast and legs. Roast the turkey for 3 hours or until a thermometer like the OXO Thermocouple Thermometer inserted in the inner thigh registers 165 degrees. (NOTE: after the first hour, tent with aluminum foil to prevent over browning.) Allow the turkey to rest for 30 minutes before removing from roasting pan. Heat 1 tablespoon olive oil in a large skillet. Add the Italian sausage, stirring to break up and crumble, and cook until no longer pink. Add 4 tablespoon butter and the diced onion and celery. Cook and stir until the butter is melted, about 3 minutes. Add the diced apple and continue cooking for 5 minutes. In a large bowl, combine the stuffing mix with the freshly chopped sage. Add sausage apple mixture, chicken broth, and egg and stir until all the breading is moistened. Pour stuffing into a lightly greased 2-quart casserole dish. Bake at 350 degrees for 15 minutes uncovered. Cover with foil and continue baking for 20 minutes. Melt butter in a saucepan over medium heat. Add onions and sauté until tender. Add minced garlic and cook just until fragrant. Whisk in the flour and cook for another 2 minutes. Slowly whisk in the apple cider, stirring to prevent lumps. 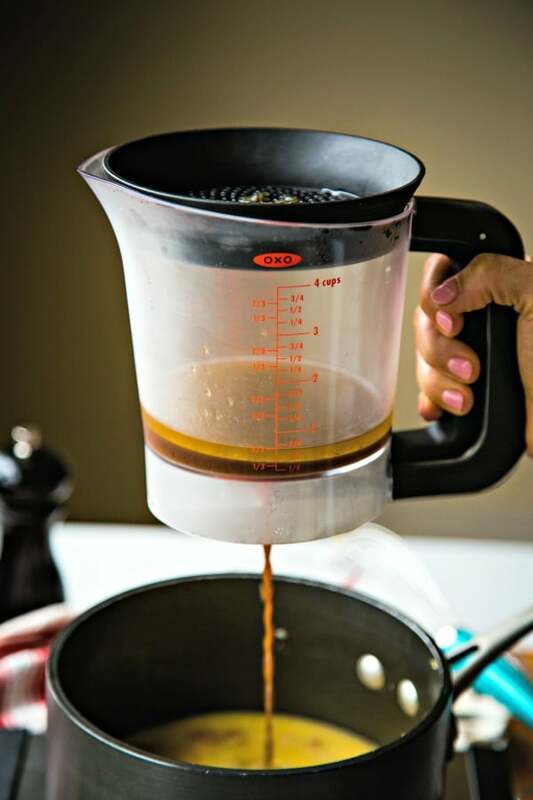 Use a fat separator like the OXO Good Gravy Fat Separator to add 1/2 cup of the turkey broth. Cook and stir until thickened, adding more broth if desired. Season with salt and pepper to taste.